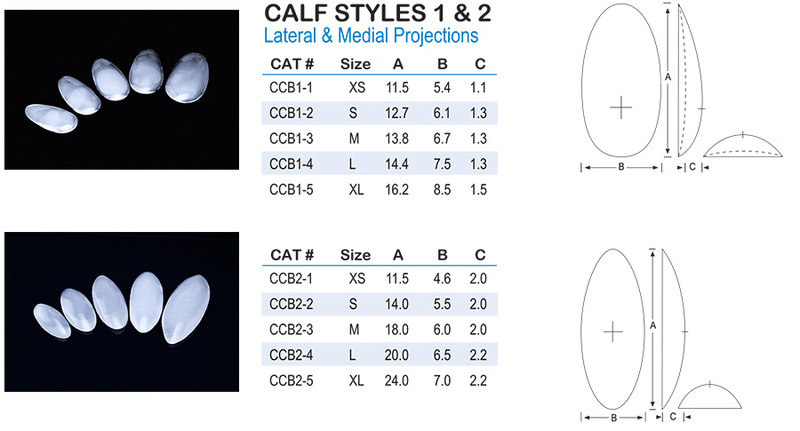 We offer the Bircoll and Aiache designs in calf Implants. It is recommended that surgeons be conservative with the degree of augmentation and exercise caution concerning patient selection to avoid complications such as compartmental syndrome. Our Pectoral implants vary in projection widely and again we recommend a conservative approach in matching the size of the implant to the patient. The Style 2 pectoralis may be placed vertically or reversed and placed horizontally on the contralateral side. Therefore a right side can be used on the left side. One free sizer is available for each implant purchased.